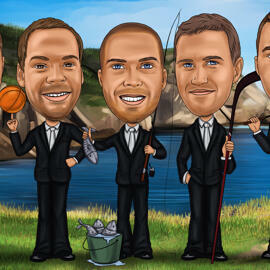 Get an original caricature gift idea of how you can gratitude groomsmen of being them a support for you. 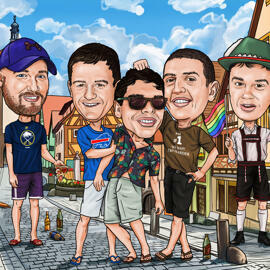 We offer you to shop bespoke caricature, which will be hand-drawn in full color pencils from uploaded photos. 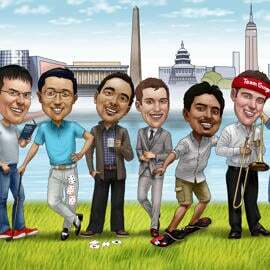 We will draw for you and your friends an amazing caricature with very funny or slightly funny exaggeration of your choice, which will be cherished forever. Mention your ideas and wishes for our artists in the requirements box below and we will make it happen. It is necessary to upload high quality images with clear eyes color. 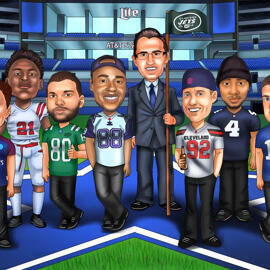 Caricature Gift for Groomsmen will be delivered as a stunning looking JPG file to your E-mail. Additional delivery options: Original Pencil Groomsmen Caricature on A4, A3 Paper, Printed Caricature of Groomsmen on Canvas or Printed Photo Copy with different sizes. Worldwide shipping is available, whether the recipient lives in USA or Australia.